Some hotels have just got it. 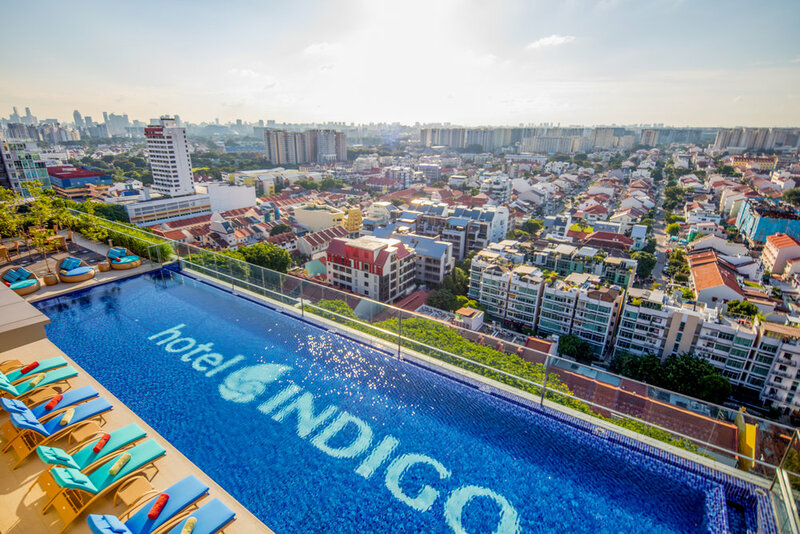 Ticking all the boxes: Hotel Indigo Singapore Katong features immaculate design, serious eco and tech credentials and a glamorous rooftop pool. It's totally funky, and totally cool. Some chain hotels are like McDonald's; you know exactly what you're going to get no matter which country you're in. Not so the Hotel Indigo brand (the hip younger sister of the InterContinental Hotel Group) where no two hotels in the chain are the same. Its latest Singapore hotel, in the heart of the untouristy Katong neighbourhood of Joo Chiat, Singapore's first designated Heritage Town, is no exception. Here the area retains its colourful charm and strong Peranakan (Straits-born Chinese) roots. Amidst modern high-rises, 1920s shophouses are home to gelateries, hip eateries, cool cafes and small boutiques. The area is a magnet for foodies who come for the famed Katong Laksa, a local savory noodle dish in a rich, coconut curry broth. Many say Singapore's best is made over the road at 328 Katong Laksa. 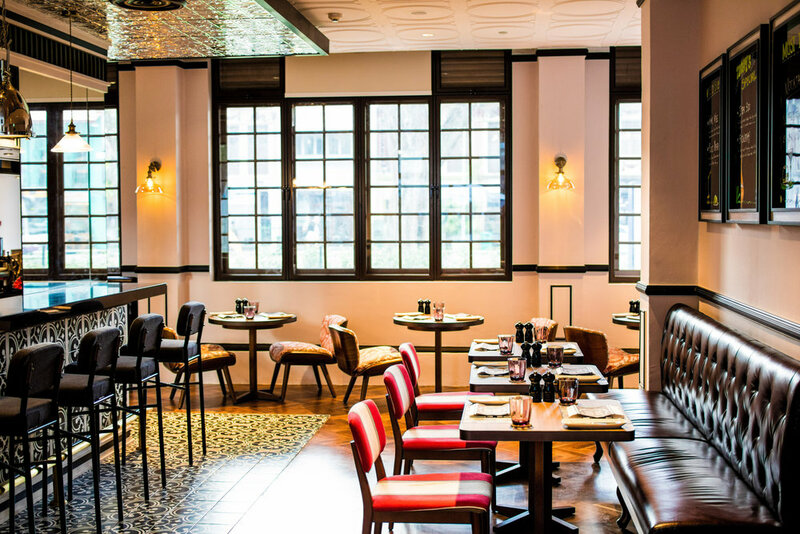 The 131-room property fronts East Coast Road, behind the former Joo Chiat police station, which is now home to Baba Chews, the hotel's onsite Peranakan themed restaurant. The discreet entrance to the Hotel Indigo Singapore Katong, concealed behind a wall of greenery. Dive right in! The hotel's rooftop pool is surely one of its best assets, especially after a day exploring. Located off a side road, the hotel's understated entrance is a striking vertical garden wall. Inside a collage of intricate Peranakan ceramic patterns and colourful pop-art renditions of water jars and art murals feature in the lobby. Bright young staff greet guests with a hot tea or coffee at check-in, while to the left is a pavilion with colourful Chinese lantern lights and a pop-up "mama stall" (Singapore's equivalent to Australia's milk bars), displaying local artisans' crafts. On the top floor is a 24-hour fitness centre and rooftop infinity pool looking across Katong's cultural enclave. 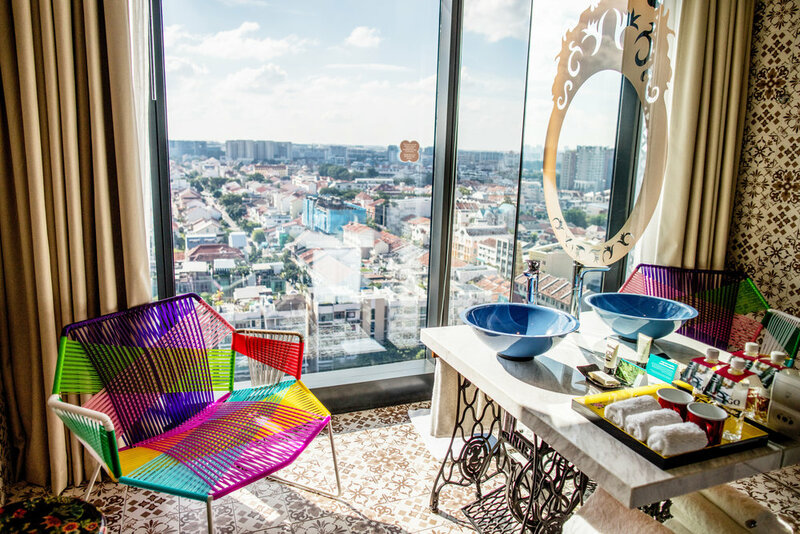 The vibrant guest rooms at Hotel Indigo Singapore Katong mirror a condensed Peranakan home. The vibrant 30-square-metre guest rooms mirror a condensed Peranakan home, with an open plan living room, bedroom and spa-inspired bathroom with aromatherapeutic toiletries. Peranakan-inspired tiles feature in the bathroom where marble vanities sit atop Singer sewing machine bases. There are also murals depicting Katong street life by local artist and illustrator Don Low, floor to ceiling city views, timber floors and quirky touches such as glass jars filled with old school Chinese sweets like White Rabbit, spittoons in the bathroom, and a carrom board fashioned into a coffee table. Baba Chews, named after philanthropist Chew Joo Chiat whom the neighbourhood is named after, serves up modern meets Straits of Malacca cuisine. Breakfasts are cafe style with a small buffet selection and choice of a la carte dishes. At the time, wait staff seemed overwhelmed by the sheer number of guests at breakfast. Dinner is a much more relaxed affair with dishes such as nonya fried rice, Hainanese chicken rice, wasabi prawns and the excellent beef short ribs rendang on offer. There's a lot to explore in the local area. Admire the pre-war shophouses along Koon Seng Road, take a mosey through Kim Choo Kueh Chang for elaborately embroidered kebaya, hand-beaded slippers, beaded purses and Peranakan ceramic ware, visit local eatery Five Star Hainanese Chicken Rice to try Singapore's national dish, have coffee at Group Therapy (tucked away on the ground floor of Katong V shopping mall). Scoop Therapy, by the same owners, is across the road for terrific gelato. Singapore's whimsical Gardens by the Bay is a short taxi ride away. Hotel Indigo Singapore Katong offers a terrific boutique stay. The welcome is warm, the rooms are chic and comfortable and the staff are genuinely keen to share their knowledge of the local neighbourhood. It offers so much more than a place to lay your head for the night. HIGHLIGHTS A swim in the 25m rooftop pool overlooking the Joo Chiat neighbourhood with its mix of old shophouses, high-rises and temples. LOWLIGHTS Breakfast, which looked Instagram-worthy, was served lukewarm both mornings, possibly due to the sheer number of guests. 86 East Coast Road, Katong Square, Singapore. Tel: +65 6723 7001; see hotelindigo.com/Singapore Rooms from $SG180 a night plus taxes. Sheriden Rhodes was a guest of Hotel Indigo Singapore Katong, a member of InterContinental Hotels Group, see ihg.com.